Over the last few weeks, I have been reading Fixing Your Feet by John Vonhof. After my Bandera experience, it became required reading for me. I learned in the Texas hill country that feet issues can derail an otherwise decent race. Keep toenails trimmed and filed. File the ends so the transition from the skin on the end of your toe to your toenail is smooth. Work at reducing any and all callouses on your toes and feet. Callouses are never helpful in avoiding blisters. The smoother the skin, the better your chances for avoiding issues. Get shoes that fit correctly and provide enough room in the toe box. On Saturday, Tanya & I had a date night. Our first activity was to get a pedicure! Yes, I felt self conscious walking into the "Nail Boutique", but I can tell you my feet felt great walking out. The book highly recommends getting pedicures, and now I do too! No, I didn't get any nail polish...and I distanced myself from the other "manicure" side of the room. I pretty much ruined the day of the poor lady below once she saw the work needed on my feet. Let's just say I haven't done much to them, but running sure has. Black & blue toenails, residual blistered skin from CP, dry, cracked, and calloused skin, and the list goes on. She went to town and really helped get me squared away. For those guys out there that don't know what happens during a pedicure, let me give you the short run down. First you soak your feet in a mini tub. Then she works all the toenails by cutting them, shooting some liquid on top, cleaning out the junk, picking away dead skin, and filing them down. Next comes the lotion stuff on the bottom of your feet followed by a metal cheese grater-like device that scrapes away all the dead skin and reduces your callouses (note - the book does not recommend having callouses shaved off). Lastly....the massage! Definitely the best part as she massages your feet & ankles/calves. I probably won't do this much, but I also won't shy away from the opportunity. I definitely noticed a difference in the look and feel of my feet later that night. Why not surprise your wife or a significant other (if you're a guy) by tossing out the idea of getting pedicures together? I can tell you Tanya was giddy for days after I mentioned the idea. I figured it was just a matter of time before I put the pieces together to start & finish an ultra strong. The CP 50 was that race. Without a doubt, there were some mishaps along the way, but boy did it feel good to overcome those obstacles and finish feeling like there wasn't much I would have done differently. The morning started early in my hotel room with the typical pre-race prep. I drove the 3 minutes to the community center and immediately met up with Jaime, Todd, Brian, Chris, Leila, and GZ. I really enjoyed seeing friendly faces at the start of a race. It reminded me of how awesome the trail running community is and helped me not get so wound up. I had never met George before and ran into him as I was coming out of a bathroom stall. My gut reaction was to say "hey" and shake his hand. Doh! Who offers to shake someone's hand after going to the bathroom?? He politely obliged and I felt like a doofus. The race began and we all made our way onto the roads for the first three mile warm-up until we hit the trails. About a mile in, I began a mental review of my fuel plan. I looked down at the two pockets on my vest that were to hold my flasks of EFS and they were empty! For the next hour, I fumed about how stupid I was for leaving not two, but three flasks in my hotel room. This was supposed to be the race where I solved the fueling riddle, and it sure would be nice if I brought the fuel with me! As much as I was frustrated about forfeiting the 1200 calories I was counting on, I had more angst about the $16 those flasks cost! When I got to the first aid station, I surveyed the scene and decided I would supplement the few gels and Powergel Blasts in my pack with oatmeal cookies. If you read about my night run a few weeks ago, you'd know I experimented with all solids foods (inc. oatmeal cookies) on a 30 miler. It didn't work out that well, but little did I know it was good practice for what I was going to have to do this day. Thankfully, I knew I had a whole bunch of gels in my bag at the turnaround. Not a cloud in the sky = Hot afternoon! Amazing views of Mt. Princeton. My first 14er in '06. Lovin' all the smooth trails. Around mile 22, Ryan Burch came running at me (his mile 28). I had met Ryan the night before at the pre-race meeting. Super nice guy. I don't know what it is, but in all my out & back races, whenever the leader passes me on their return trip, I have a vivid memory of exactly where it happened. 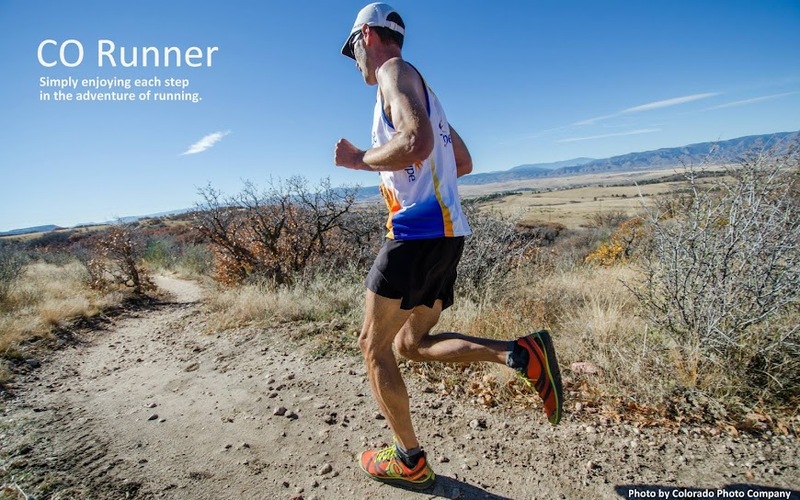 Duncan Callahan at Silver Rush, Matt Carpenter on Pikes, Geoff Roes at Run Rabbit Run. Ryan came flying by looking as strong as ever. I fully expected to see one of the other fast guys chasing him, but no one came for quite some time. Ryan had a least a mile on Duncan and Dylan, who were the next to come along. A huge congrats to Ryan for winning and setting a new course record in 6:37. By counting all the runners passing by as they headed out on their second loop, I figured I was around 30th place. I hit the turnaround in 3:58 and was back on the course at 4:01. Not long after, I passed Jaime coming in for his 25 miles finish and then ran past Tracey (aka Runs With Wolves) whom I also met at the pre-race meeting and had only known previously from the Runners World Trail Running Forums. I gave a quick shout out as she looked great despite having a rough day. She lays claim to the best race report I've ever read (from the 2010 Pikes Peak Marathon). She fell on the descent cutting her head and gushing blood all over her face, shirt and PPM bib... and she still finished in an awesome time! Miles 25-32 were predominantly uphill. I hiked a bunch of the long steep sections, but I started passing a few people who were struggling. That provided some motivation and it was around mile 32 that I threw my "conservative" plan out the window and decided to push it to see what I could do during the final 18. I ran everything I felt I should have run, and fast walked all the sharp climbs. As I passed people, I had visions of other races when I would get passed back after I crashed and burned. No, on this day the few stomach and side cramps I got were non-factors and overall I felt great! I blew through the 40's still chugging along (amazing new experience to be feeling great that late in the race) and was looking forward to the final three miles of downhill road running. I thought for sure I'd be able to crank those out. The road finally came, but the energy I had anticipated having simply wasn't there. I ran the whole way in, but it wasn't exactly the epic finish I had pictured just a short time earlier. I knew a time of around 8:30 was possible, but after missing a turn and having to backtrack, I finally crossed the finish line in 8:33 and later found out that was good for 18th overall and a 40 minute PR. The worst part of the day by a long shot was the drive home. I remember thinking when Jim P drove home right after Run Rabbit Run last year, that I'd never do something like that that. But there I was cruising down 285 a mere two hours after crossing the finish line. I stopped and hobbled around a convenience store in Fairplay and then satisfied my hunger at Qdoba in Conifer. I probably should have stopped 2-3 more times to stretch the legs. All in all, it was a great race that I'll certainly consider running again. The course had a few technical spots, but 85% of the trails were smooth and obstacle free. It was hillier than I was expecting, but I guess that 4700' per loop needs to happen one way or another. While I'm enjoying the afterglow of this race, my thoughts are shifting to the San Juan Solstice 50 in just six weeks. Those 50 miles are going to be a whole different ball of wax which gets me excited, but also has me breaking out in cold sweats. This Saturday kicks off my journey to Leadville. Only 107 days away! The Collegiate Peaks 50 has been on my list and I'm glad I'll get to knock it off. There are a long list of fun folks that are going to be there, which has me just as excited to hang out as I am to run. My loose plan for this race is to produce a solid effort, but err on the side of being conservative. Two loops at 25 miles and 4700' of elevation each. With the San Juan Solstice 50 coming up in six weeks, I can't really afford a long recovery that would inhibit me from getting in some higher altitude runs over the coming weeks. A big success for this race would be nailing my nutrition/hydration for all 50 miles. I typically have a rough patch in the late 20's and early 30's. I'm not sure if I can avoid that, but I do feel I should be able to minimize it. Despite my conservative approach, I still want to shoot for a goal time of around 9 hours. Breaking nine would be sweet and a PR for me! This is assuming I keep up my nutrition, prevent my feet from blowing up, and don't crash and fall. The weather is looking amazing! It may even be a little on the warm side. With the cool & windy spring we've had, I will not complain at all about a warm weather day running in the mountains! I thought this was an interesting article that confirms that I'm not crazy (well, maybe a little) for running these long distances!